This guide will attempt to organize everything someone living in the Kelowna area might want to know about flying out of U.S. airports. Good deals out of Bellingham are typically found on 2 airlines, Alaska Air and Allegiant Air. (Although there has been the occasional deal on Delta). There's also Frontier Airlines which flys to various U.S. cities (Chicago, Dallas, Denver, etc). 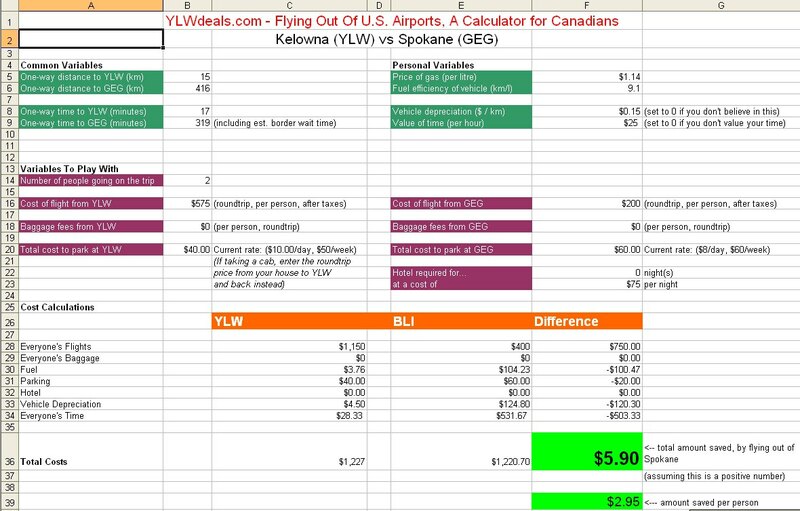 A lot of people fly out of Bellingham to get to Las Vegas, which can be significantly cheaper than flying out of YLW. Allegiant also started flying to Hawaii relatively recently, and there's been some pretty crazy deals, bringing stiff competition to Alaska Airlines, who flys direct to multiple Hawaiian islands. There can also be good fares to California and Arizona. Internationally, deals out of Bellingham are less likely to be much cheaper, or can involve more complicated and lengthier routes than flying out of YLW. It's a smaller airport, and it's strengths are serving the U.S. destinations listed above. Also, when comparing costs, be aware that Allegiant charges extra for absolutely everything, including even carry-on luggage now. Go to the YLW vs BLI worksheet and enter in a few variables to calculate what your true savings would be. Using common averages, I've found that if the flight from Bellingham is about $300/person less than the flight from Kelowna, the average person is only breaking even. In my opinion, when the flight from Bellingham is at least $400 less per person than the flight from Kelowna, it becomes worth the drive. This is based on my calculations using average factors, and 2 people in a vehicle. You can see the example in the spreadsheet that was used to draw this conclusion. Parking is currently $9 to $10/day, according to the Bellingham Airport website. You can also park at WikiWiki Park N Shuttle for $8/day. There is also a company called Designated Park & Ride which offers parking for $5/day, but it looks like you would also need to pay for a taxi ride of $8 each way, and reservations are required. Is there any public transportation from Kelowna to Bellingham airport? Greyhound - $120 roundtrip, 8 hours each way. Spokane is served by most major U.S. airlines, and a variety of international airlines. There can certainly be cheaper fares than flying out of Kelowna, it's just a question of whether they're cheap enough to warrant the 5 hour drive each way. As you'll see below, the price difference would need to be significant to warrant the drive, meaning that it's likely only on very expensive international destinations outside of North America where the price differential can be great enough to make it worth it. If you've downloaded the Excel file, please note that you will need to switch to the YLW vs GEG worksheet at the bottom of Excel. Go to the YLW vs GEG worksheet and enter in a few variables to calculate what your true savings would be. Using common averages, I've found that if the flight from Spokane is about $375/person less than the flight from Kelowna, the average person is only breaking even. In my opinion, when the flight from Spokane is at least $475 less per person than the flight from Kelowna, it becomes worth the drive. This is based on my calculations using average factors, and 2 people in a vehicle. You can see the example in the spreadsheet that was used to draw this conclusion. Parking is currently around $9.50/day, $67/week at Spokane Airport. There are also various Park, Sleep, Fly packages available at nearby hotels. Is there any public transportation from Kelowna to Spokane airport? There are no great options unfortunately. Greyhound is very expensive, and takes more than 24 hours! guides, bellingham, bli, spokane or geg. 2 Responses to "The Official Guide For Canadians Flying Out Of U.S. Airports (from Kelowna & area)"
I find that you can save even more if you find an overnight hotel by the airport with shuttle included that will keep your car in its lot while you are away. Some will even do this for 2 week vacations as long as you stay an overnight at both ends of your trip (which you'll probably need anyhow.) We've never had a problem with vandalism or break-in when we do this but our car is just a regular Toyota Camry LE in a dull beige and doesn't attract much attention.